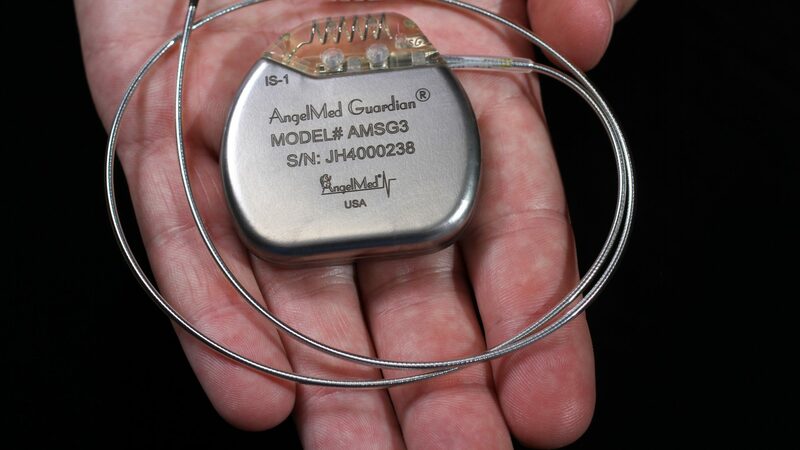 After you and your cardiologist have determined that the AngelMed Guardian is right for you, an implant surgery will be scheduled. The surgery is similar to that of a pacemaker and includes surgically implanting a sensor lead into your heart and attaching it to the implanted device. This is typically done on an outpatient basis under conscious sedation and the surgery should take about 1 hour. The monitor is set in collection mode, which will cause it to start collecting your heart data every 90 seconds. About 2 weeks later you will have a follow-up visit where the monitor will be programmed according to the signals it has collected for you over the prior two weeks. The Guardian sets its ischemia detection thresholds based upon each patient’s own heart signal profile- it is customized for each individual patient. At the follow up visit you will be given an external patient alerting accessory and will be trained on what to do when patient notification occurs. This includes pressing a button to stop the patient notification and also either going to the emergency room if the notification is an “Emergency Alarm” or making an appointment with your doctor if the alarm is a “See Doctor Alert”. If you have an Emergency alarm you should call 911 to go to the ER for evaluation. After you call 9-1-1, the 9-1-1 operator may recommend that you take an aspirin. At your visit you will be monitored and standard of care tests will occur to determine your cardiac status and determine if an intervention should occur. Remember to always follow up with your doctor after an alarm. See Doctor alerts can occur if there is a condition which requires attention, but does not indicate a heart attack. For example, a See Doctor alert can occur if you forget to take your Beta Blockers for several days since the monitor will detect fast heart rates. See doctor alerts can also occur if you develop a new type of arrhythmia, or other condition which merits review by a doctor. See Doctor alerts can also occur if trend data suggest that there is a slow progression of plaque build-up which is making it harder for your heart to operate efficiently. Guardian patients must return to their cardiologist every 6 months for a check-up to have data from the implantable reviewed. The Guardian has an expected battery life of 3 years depending upon how many alarms occur during that period. The replacement procedure includes replacing your monitor but the lead in your heart will simply be attached to the new monitor. The replacement procedure should take less than 1 hour. allowing patients to arrive at the ER in a timely fashion, which is important in increasing the benefit of intervention in saving heart muscle. A portion of the ALERTS subjects were evaluated in a sub-study, that examined quality of life. 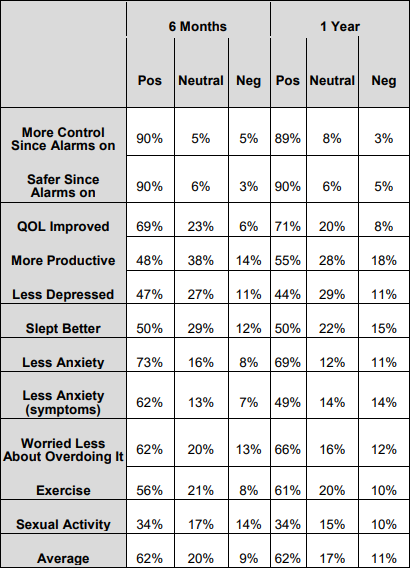 The results showed that many patients reported having less stress, improvements in sleep, less anxiety during exercise, and improvements in other areas as shown in the figure below.